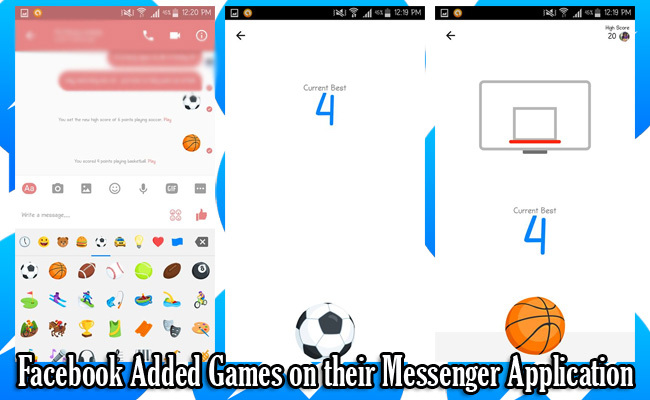 As one of the most popular social media platforms, Facebook added games on their messenger app. They first introduce a basketball game last March because of the new NBA season and March Madness. You can use this by sending a basketball emoticon to your friend you want to play with then tap the basketball emoticon to start the game. You just need to flick your finger at your screen to shoot the ball on the hoop. Once you miss, there will be a way to go emoticon to react on your weak shooting skills on the other hand if you shoot the ball on the bucket, you will get a happier reaction. Aside from that, there will also show emojis that will encourage you as the prolong. According to the company, it was a huge hit among users for it was played 1 billion times. You will only be able to play the game if you’re app is in the latest version of messenger. Aside from basketball, facebook also had other games such as chess where they introduced it last February and you can play it by typing the keyword @fbchess at the chat box. They also have a soccer game called “keepy up” to commemorate Copa America and Euro 2016. You can launch the soccer game the same way you start the basketball game. The goal of keepy up is keeping the soccer ball at the air. Facebook messenger also added 1,500 new emoticons to serve their users with various ethnicities. It now has female swimmers, police officers, pedestrian, a runner and many more. Facebook also revealed that they will add more emoticons in the future. It is a good news for the users so that they will not be weary to the same emoticons that they are using when interacting with their friends.